EnjoyTrip is depicting itself as a travel and holiday group, believes in proposing high class services with dedicated hard work in the favour of customers. Our dream is to make sure that we are providing quality services at affordable rates. 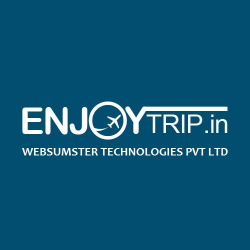 EnjoyTrip is the clan enterprise of Websumster Technologies Pvt. Ltd. Our group is offering versatile choice of magnificent travel destinations across India and the world. We intend to grow healthy relationship with our customer base, for ages to come.